Mike Mignola presents a Hellboy yarn combining Shakespeare and graverobbing in this followup to Dark Horse's Eisner-nominated Books of Hauntings and Witchcraft. 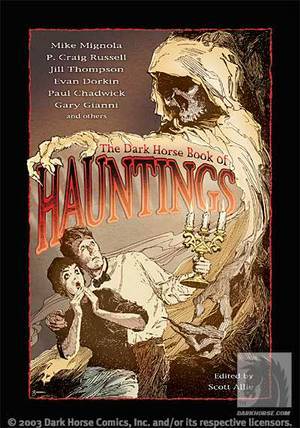 Also returning this volume are Jill Thompson, who won a 2004 Eisner for her painted work in Hauntings, and her collaborator Evan Dorkin, with another occult canine adventure. New additions for this volume include Goon creator Eric Powell, celebrated B.P.R.D. artist Guy Davis, and the artist who spent the last twenty years making superhero comics more scary-Kelley Jones. Cover artist Gary Gianni also returns, mixing prose with comics, with a rare tale by the man ultimately responsible for Dark Horse's biggest hit in years-Conan creator Robert E. Howard. * Anthology of original material featuring the award-winning talents of Mike Mignola, Evan Dorkin, Jill Thompson, Eric Powell, and more! * Features an original Mike Mignola Hellboy story.